Tega Cay Golf Course is carved into the mountain terrain along Lake Wylie. Three championship nines challenge every skill level. Expansive vistas create a scenic backdrop for every shot. Tega Cay is minutes from Charlotte and Rock Hill, has 27 Holes, a PGA Professional Staff, Practice Facility, 15,000 sq. ft. Clubhouse with Banquet Facility, Outdoor Event Pavilion and Tennis Courts. Successful Events happen at Tega Cay Golf Club with a range of tournament formats, Contest holes, Scoring, Sponsorship Signage, Golf Clinics, Banquet Services, Practice Range, and dedicated staffing for special events. Here customers are important. 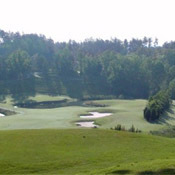 Tega Cay is unique in the Charlotte area as the only 27 hole course in the region. With extreme topographical changes it is the ultimate "target golf-mental game" challenge. It is no coincidence that the last hole of the Grande View Nine was recently voted "Favorite 18th Golf Hole in the Charlotte Area" by WFNZ listeners.